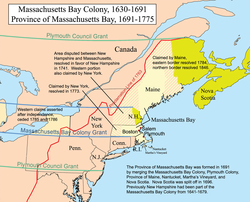 The Province of Massachusetts Bay  was a crown colony in British America and one of the thirteen original states of the United States from 1776 onward. It was chartered on October 7, 1691 by William III and Mary II, the joint monarchs of the kingdoms of England, Scotland, and Ireland. The charter took effect on May 14, 1692 and included the Massachusetts Bay Colony, the Plymouth Colony, the Province of Maine, Martha's Vineyard, Nantucket, Nova Scotia, and New Brunswick; the Commonwealth of Massachusetts is the direct successor. Maine has been a separate state since 1820, and Nova Scotia and New Brunswick are now Canadian provinces, having been part of the colony only until 1697. Colonial settlement of the shores of Massachusetts Bay began in 1620 with the founding of the Plymouth Colony. Other attempts at colonization took place throughout the 1620s, but expansion of English settlements only began on a large scale with the founding of the Massachusetts Bay Colony in 1628 and the arrival of the first large group of Puritan settlers in 1630. Over the next ten years, there was a major migration of Puritans to the area, leading to the founding of a number of new colonies in New England. By the 1680s, the number of New England colonies had stabilized at five; the Connecticut Colony, the Colony of Rhode Island and Providence Plantations, and the Province of New Hampshire all bordered the area surrounding Massachusetts Bay and Plymouth. Massachusetts Bay, however, was the most populous and economically significant, hosting a sizable merchant fleet. Massachusetts and Plymouth were both somewhat politically independent from England in their early days, but this situation changed after the restoration of Charles II to the English throne in 1660. Charles sought closer oversight of the colonies, and he tried to introduce and enforce economic control over their activities. The Navigation Acts passed in the 1660s were widely disliked in Massachusetts, where merchants often found themselves trapped and at odds with the rules. However, many colonial governments did not enforce the acts themselves, particularly Massachusetts,  and tensions grew when Charles revoked the first Massachusetts Charter in 1684. After the Boston Tea Party in December 1773, Hutchinson was replaced in May 1774 by General Thomas Gage. Gage was well received at first, but the reception rapidly became worse as he began to implement the so-called Intolerable Acts, including the Massachusetts Government Act, which dissolved the legislature, and the Boston Port Act, which closed the port of Boston until reparations were paid for the dumped tea. The port closure did great damage to the provincial economy and led to a wave of sympathetic assistance from other colonies. On May 1, 1776, the General Assembly adopted a resolution declaring independence in the name of "The Government and People of the Massachusetts Bay in New England". This was followed by the United States Declaration of Independence on July 4, 1776, declaring the independence of all of the Thirteen Colonies. Surveys in the 1690s suggested that the original boundary line with Connecticut and Rhode Island had been incorrectly surveyed. In the early 18th century joint surveys determined that the line was south of where it should be. In 1713 Massachusetts set aside a plot of land (called the " Equivalent Lands") to compensate Connecticut for this error. These lands were auctioned off, and the proceeds were used by Connecticut to fund Yale College. The boundary with Rhode Island was also found to require adjustment, and in 1746 territories on the eastern shore of Narragansett Bay (present-day Barrington, Bristol, Tiverton and Little Compton) were ceded to Rhode Island. The borders between Massachusetts and its southern neighbors were not fixed into their modern form until the 19th century, requiring significant legal action in the case of the Rhode Island borders. The western border with New York was agreed in 1773, but not surveyed until 1788.